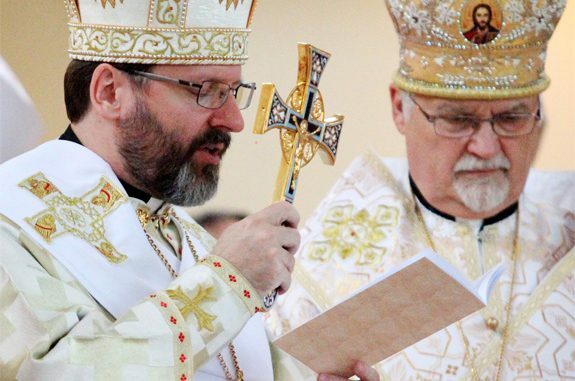 "One gets the impression that the Moscow Patriarchate is either stubbornly refusing to admit that it is a party to the conflict, namely, that it openly supports the aggression of Russia against Ukraine…"
His Beatitude Sviatoslav, the Head of the UGCC, shared with us his impressions of the meeting in general and of the document in particular. Your Beatitude, kindly share with us your impressions of the meeting between Pope Francis and Patriarch Kirill. What can you say about the Joint Declaration that they signed? From our experience, gained over many years, we can say that when the Vatican and Moscow organize meetings or sign joint texts, it is difficult to expect something good. Firstly, I would like to say something about the meeting of the Holy Father with Patriarch Kirill, and then I will comment on the text of the declaration. One notices immediately, especially from their comments after the meeting, that the two sides existed on two completely different planes and were pursuing different goals. His Holiness Pope Francis experienced this encounter primarily as a spiritual event. He opened his remarks by noting that we, Catholics and Orthodox, share one and the same Baptism. In the meeting, he sought out the presence of the Holy Spirit and received His support. He emphasized that the unity of the Churches can be achieved when we travel together on the same path. From the Moscow Patriarch one immediately sensed that this wasn’t about any Spirit, or theology, or actual religious matters. No common prayer, an emphasis on official phrases about “the fate of the world,” and the airport as a neutral, that is, non-ecclesial environment. The impression was that they existed in two parallel worlds. Did these two parallel realities intersect during this meeting? I don’t know, but according to the rules of mathematics, two parallel lines do not intersect. I found myself experiencing authentic admiration, respect, and a certain reverential awe for the humility of Pope Francis, a true “suffering servant of God,” who seeks one thing: to bear witness to the Gospel of Christ before humankind today, to be in the world, but remain of Christ, to have courage to be “not of this world.” Thus, I would invite all not to rush in judging him, not to remain on the reality level of those who expect only politics from this meeting and want to exploit a humble pope for their human plans at all costs. If we don’t enter into the spiritual reality of the Holy Father and do not discern together with him the action of the Holy Spirit, we shall remain imprisoned by the prince of this world and his followers. Then, for us, this will become a meeting that occurred but didn’t happen. Speaking of the signed text of the Joint Declaration, in general it is positive. In it are raised questions, which are of concern to both Catholics and Orthodox, and it opens new perspectives for cooperation. I encourage all to look for these positive elements. However, the points which concern Ukraine in general and specifically the UGCC raised more questions than answers. In general, I would like to say that paragraph 26 of the Declaration is the most controversial. One gets the impression that the Moscow Patriarchate is either stubbornly refusing to admit that it is a party to the conflict, namely, that it openly supports the aggression of Russia against Ukraine, and, by the way, also blesses the military actions of Russia in Syria as a “holy war,” or it is appealing first of all to its own conscience, calling itself to the same prudence, social solidarity, and the active building of peace. I do not know! The very word “conflict” is obscure here and seems to suggests to the reader that we have a “civil conflict” rather than external aggression by a neighboring state. Today, it is widely recognized that if soldiers were not sent from Russia onto Ukrainian soil and did not supply heavy weapons, if the Russian Orthodox Church, instead of blessing the idea of “Russkiy mir” (“the Russian world”) supported Ukraine gaining control over its own borders, there would be neither any annexation of Crimea nor would there be any war at all. It is precisely this kind of social solidarity with the Ukrainian people and the active construction of peace that we expect from the signatories of this document. I would like to express a few thoughts on the phrase that encourages Churches in Ukraine “to work towards social harmony, to refrain from taking part in the confrontation, and to not support any further development of the conflict.” Churches and religious organizations in Ukraine never supported the war and constantly labored towards social peace and harmony. One need only to show some interest in the topics raised through the appeals of the All-Ukrainian Council of Churches and Religious Organizations over the last two years. It is for this unity with the Apostolic See that our Church’s twentieth century Martyrs and Confessors of Faith gave up their lives, sealing it with their blood.